The robot must get onto the Research Vessel and put the Submarine overboard from there. The Sub must be touching blue on the mat. The deployment is worth 40 points if the Sub is upright and 35 if it is not. To show the location of the ancient shipwreck, the robot must flip transect flags up. Any number of Flags up at all (of any color) is worth 30 points, and each complete east/west row is worth an additional 15 points. The robot must get the Protective Structure to straddle the Pump Station, with at least one of the Protective Structures foot pads completely past the Pump Station's south wall. This result is worth 40 points. The robot must install the new segment of pipe so that the team can test the line. When the segment is installed, the team must use hand force at the east end to raise the yellow flags. The yellow flags raised are worth 40 points. The robot must tag the grey fish only. The grey Fish must be out of alignment with its location mark in some way and all green Fish must remain aligned with theirs. This result is worth 35 points. The robot must get the Dolphin back into the ocean. The Dolphin touching blue on the mat is worth 25 points. 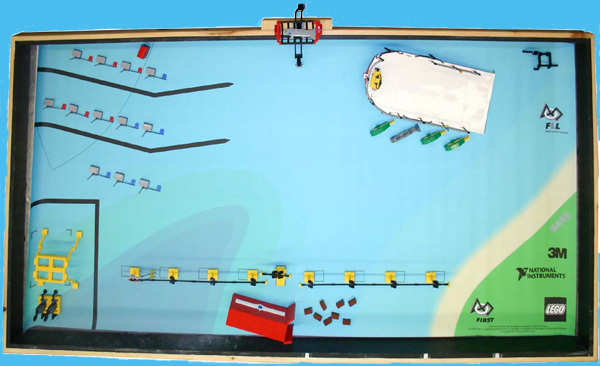 The robot must move the black structural debris either to shallow water, as an Artificial Reef, or to Base, as recyclable material. The Reef touching shallow water (the lighter blue shade on the mat) or at Base is worth 40 points. The robot must get the Shipping Container and its spilled Crates of plastic bags to Base so they don't harm any wildlife. The Shipping Container at Base is worth 30 points. As Bonus Objects, all Crates are worth points anywhere on the table. Crates at Base are worth 5 points each, and other Crates on the table are worth 2 points each. When removing a Crate, the referee takes the one farthest west at that time. The robot must get the Artifacts completely off the outline of the ancient shipwreck for 25 points, or back to Base for 35 points.